My guess is that they fold - the rear triangle rotating about the vertical section of seattube just in front of the bottom bracket. Rudge Bi-Frame did it better. I saw a gentleman riding a purple ordinary along by the river in Battersea this evening. It looked to be a modern one as the rims matched the frame colour. A Dyna-tech Corsa 405 Titanium. It looked like a classic 80's geometry, lugged frame, down tube levers, and a beautiful red fading to silver paint job all of which made me question the decal which read Titanium. There were certainly DynaTech Ti bikes. ISTR the Dynatech thing was that the frames were glued together using aviation bonding technology. So the decals were true. It looked wonderful and was set up for TTs, with tri bars and gear ratios to match. It was just a pity the owner wouldn't take his ipod out so that I could compliment the bike before the train arrived. Saw a really strange 'bike' t'other day but did not have photography equipment to hand. Local market day was on and saw a chap moving on a three wheeled vehicle (smal dia wheels) moving from side to side and treading on paddles of some sort. On the train back from Whitstable on Sunday (on which there were at least half a dozen bikes), there was a classic Guerciotti. Early 80s, at a guess, and in good condition. Yesterday, I saw a smart looking, if tatty, silver mixte being wheeled along by a woman. I was surprised to find out it was an Allin. I'm not sure of the history, but I think it must be 1970s at the latest. In Hyde Park yesterday, a bike with what looked like a frame made of a pair of parallel square section tubes, if you see what I mean. Just in a straight line from head tube down to rear axle, with seat tube sticking up. Wheel seemed to be 26 inch. No pictures I'm afraid and I was about 50m from it. Saw Dursley Pederson dude again last night. Following on from my unexpected sighting of an Allin the other day, this morning, I spotted an old gent (not in cycling clothes) pushing a rather elegant black framed bike with red writing on it. As I passed, I read the gothic-esque script and realised I was looking at a tatty Ephgrave! Yesterday, a nice early '80s 531 frame with fancy lugs built by an outfit called Stride of Southampton. Very small frame ridden by a very short woman, who clearly loved it very much. This morning I (on foot) hear a wheel noise behind me. Was about to get annoyed by another pavement cyclist when a teenage boy (maybe 13 or so) whizzed past me on a unicycle. He was obviously using it to commute as he had a rack attached to the post, on which he was carrying a school bag. That made me not . I saw a Calfee Bamboo bike locked up in Horsham town centre. It was very pretty. I also saw a chap in Balham on a smart classic road bike - sort of greeny-blue with chromed ends and an Italian-sounding name, and dripping with Campag Record. I tried to remember the name, but, when I got to Tooting, i saw the clown with the tyre off, and I was a bit flabberbegasted. Anyway, I've seen this fast chap once before. He is extremely fit, and today was wearing a 'World Masters Championship' jersey. Very cool. I wanted to ride with him a bit longer, but he took a more marginal route across a congested Tooting Bec junction, and then I got stuck behind some cautious riders, so he was away. I must look out for him again and get what his bike is. I just remembered. It was a Daccordi. Saw this chap again today. He was riding up from Clapham, and passed me, but I stayed with him up past the Common to Clapham South, where he used his superior experience of bunch riding to pass other cyclists who I would give a wider berth to, and he was away. I noticed that, despite his perfect shiny bike, and stylish demeanour, his shorts had a rip in them. I hope he hadn't had an off. 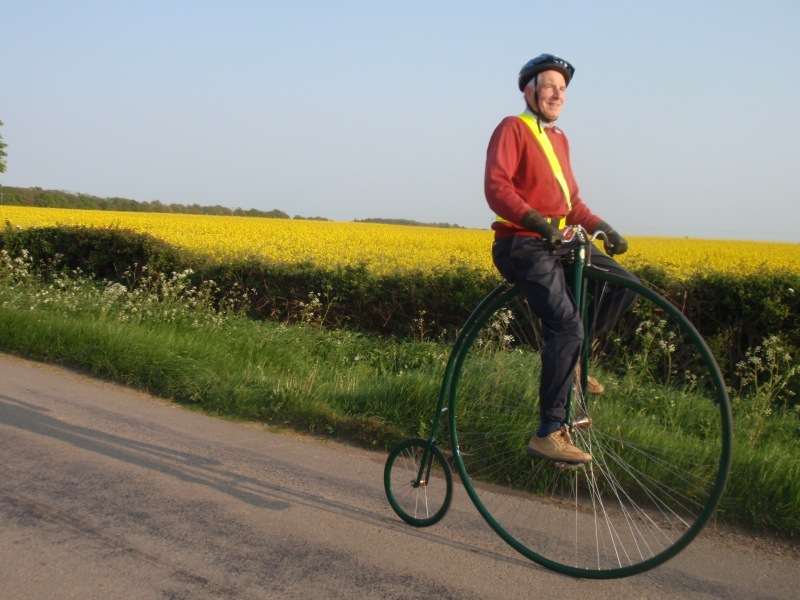 A Penny Farthing on a cyclepath on the approach to Chelmsford. Friday lunchtime. A Kona Jake on Borough High St. Not so unusual, but I was amused that it was parked outside Belushi's. More interesting: Locked up in Broad Street, Reading, an old Bevilacqua (from Cicli Bevilacqua of Pescara, a bike shop dating back to 1905 & now called Bevilacqua Sport). Dunno what tubing the frame was, but the forks were Oria, gruppo Nuovo Record (7 speed), Saccon brakes (probably not original - looked newer), Campagnolo headset & rims. Stem was new, saddle a cheap looking fat San Marco gel thing, which with the badly corroded fluted seatpost (original?) held on by a nut & bolt badly let down a generally nice old bike. Most expensive bike in their online shop 6900 Euros. Saw two unusual bikes yesterday, but couldn't see the names. The first bike was flat-barred, hub-geared commuter, all looked rather sensible, but it had no top tube. The second bike had a top tube but no down tube. The second bike had a top tube but no down tube. 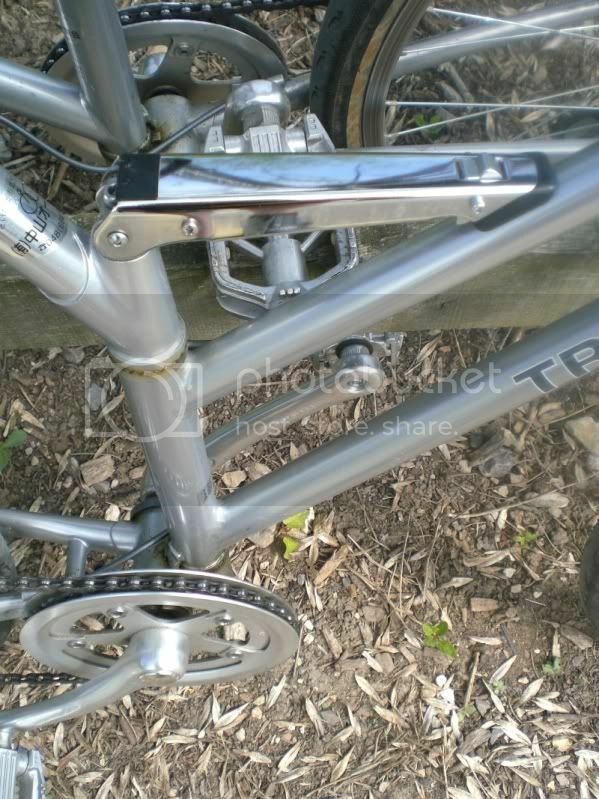 Some kind of folder, like a Swissbike? Don't think it was a folder. What tubes there were seem to be of normal size. One other thing which was different (IIRC) was that the seat stays ended at the top tube, a short distance in front of the seat tube.